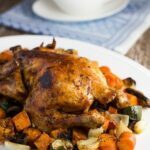 What’s not to like about Roast Chicken and Vegetables? It is such a classic meal and a favourite for so many people. Whilst this recipe adds a slight twist – roasting the chicken in butter and garlic – rest assured that it is still going to please friends and family any time you bust it out! It is fairly inexpensive, easy to make and I guarantee that you won’t want to buy bbq chickens from the supermarket anymore (if that is what you do). Importantly, by roasting it yourself, you get to choose where your chicken comes from, and it won’t have been sitting in the warmer at the supermarket. 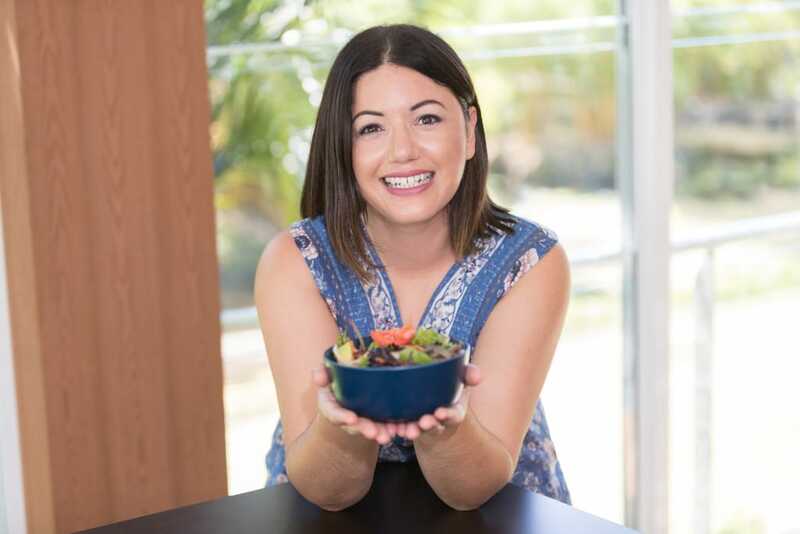 If you after some more chicken recipes, then check out my slow cooker butter chicken, gluten free chicken schnitzel or Byron Bay salad. I hope you like my recipe! Pre-heat oven to 225 degrees celcius. Rinse and pat chicken dry. Place the chicken in a large baking dish or roasting pan. Place all the vegetables around the chicken. Mix the spices and butter in a bowl and pour over the chicken and vegetables, making sure that everything is coated well. Sprinkle with salt and pepper and place in the oven. Cook for 15 minutes, then then turn over the chicken and vegetables and cook for another 15 minutes (this will help crisp the skin up). Turn the oven down to 200 degrees Celsius and cook for 60 minutes or until the chicken’s temperature is above 170 degrees Celsius. Make sure you turn the chicken and vegetables a few times while cooking. Take out of the oven and let is rest for 10-15 minutes. Slice and serve with the vegetables. You may wish to use some of the remaining juices to make up a healthy gravy.